When I got back from electioneering on Thursday, it was still bright and sunny , so I hopped round the garden happy-snapping at plants. It’s taken til now to find time to upload them. The full results are here, but below are some edited highlights. We’re still following the advice of letting the garden get on with it for the first year before taking any radical decisions, so most of the plants there we inherited. The only exception is the large row of evergreen trees that the insurance company wanted us to cut down because they were endangering our foundations. 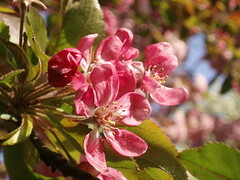 Amongst the tree-stumps, I am planting veg seeds, so far runner beans, French beans, peas and lettuce. Nothing has sprouted yet. 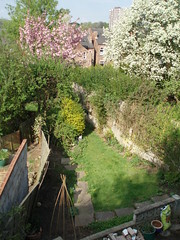 An overview of the garden visible from the house. There’s a cat hiding under the bush in the middle, and you can just see the patio. Just out of shot at the bottom is the patio with plants in tubs, and the lean-to, with clutter. With the trees in leaf, the garden is very little overlooked — they mask the tower blocks almost completely. Out of shot on the top left is the bottom wedge of the garden, with the shed and compost bin. This plant is growing up the wall next to the lean-to and seems to be suffering some kind of disease that is killing off half the leaves. They’re turning a white colour. I don’t think it’s variegation. 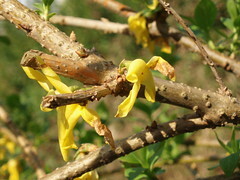 First step off the patio is this lovely yellow thing, now mostly past its best and probably in need of a prune. Growing underneath it is a pansy. 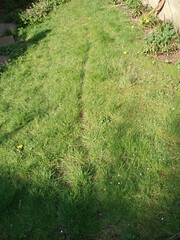 This is a well trodden animal path down the lawn–we’ve seen a regular parade of black and white cats come through the garden, and we suspect foxes do as well. It’s overdue time to buy our first lawnmower! 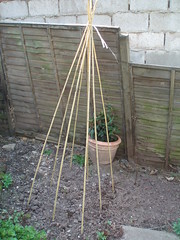 Eight bean poles, sixteen bean seedlings in the ground for nearly a fortnight now, but no sign of germination. Runner beans are one of a select band of vegetables I actually like. My grandfather used to grow huge quantities and freeze them. 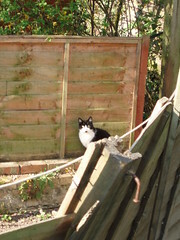 One of the many black-and-white cats that parade through our garden every day, peeking impertinently through the French windows and wondering that we have the temerity to walk in our own garden. 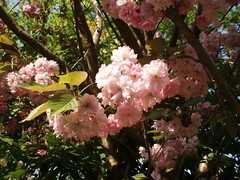 There are two different pink flowering trees at the bottom of the garden. 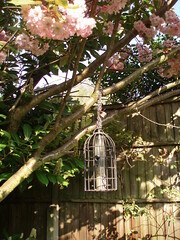 The bench faces the birdfeeder. The bottom of the garden looks like remote woodland, not city suburb. There’s a squirrel in that tree. Lovely yellow thing? I think that the word you are looking for is Forsythia. 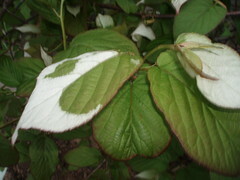 The plant with white splodges on the leaves is an Actinidia Kolomikta – and the white is quite normal, they should start going pink in places soon. If you google for it, you’ll find lots of information on them. lovely yellow thing might be winter flowering jasmine if it’s already over??? Thank you all for the info — I didn’t realise AskEU extended this far!